The bill honors the 50th anniversary of Apollo 11, the first manned mission to the Moon and one of the greatest and most significant events in human history. Apollo 11 launched on July 16, 1969; on July 20, Neil Armstrong became the first person ever to set foot on the Moon. As he stepped onto the lunar surface from the “Eagle” Lunar Module, he said, “That's one small step for man, one giant leap for mankind.” Buzz Aldrin followed him moments later. The third astronaut, Michael Collins, remained in lunar orbit in the Command Module. The colorization is precision-printed using a revolutionary new technique; it the highest quality in the world. 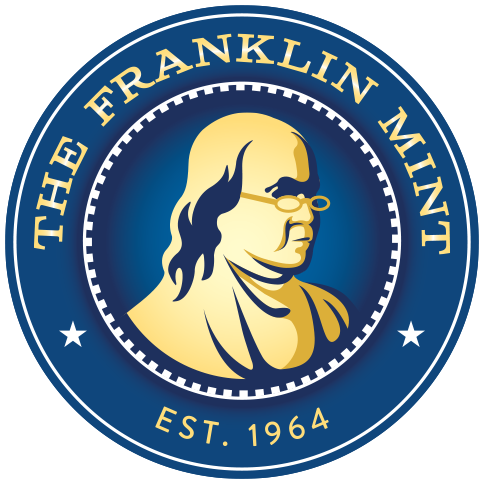 The bill is in Crisp Uncirculated condition and is a genuine legal tender U.S. bank note. 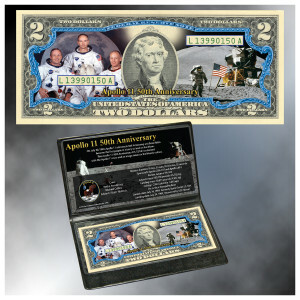 Appropriately, the $2 bill is America’s only commemorative bank note design, and this is the first time that Apollo 11 has officially appeared on a legal tender U.S. bank note. The front of the note is colorized to show the official NASA portrait of the three-man Apollo 11 crew with the Moon in the background. The colorization is privately applied, since the U.S. government does not have the capacity to create enhanced notes. It is not available from the U.S. Treasury but ONLY through special offers like this. $2 bills are printed in very limited quantities and are rarely seen in circulation. Most are acquired by collectors, but just a tiny fraction of all $2 bills have been set aside for this special Apollo 11 colorized edition. This is a limited edition that is available for just a short time; it is being released in conjunction with the historic 50th anniversary of Apollo 11. The bill is displayed in a custom holder that preserves its condition and allows it to be safely shown to family and friends. The holder includes a narrative about the history and importance of Apollo 11, and a Certificate of Authenticity.